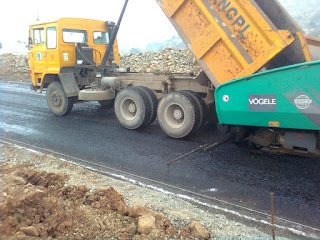 SU Toll Road Private Limited is the concessionaire being the special propose vehicle (SPV) of M/S Reliance Infrastructures Ltd. is constructing 136 km long 4 lane National Highway (NH68) road from Salem to Ulundurpet in the state of Tamil Nadu with a concession period of 25 years. This was the first project of more than 100 km that has been awarded by NAHI on BOT (Build, Operate & Transfer) Toll basis that time. 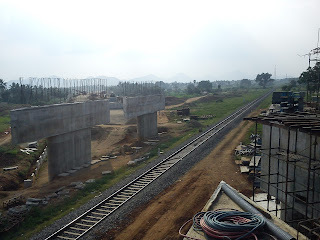 The total estimation of this project is 1061crores. This is divided into 2 packages (0.313to62.25km & 62.25to136.670km). Totally it consists of 3 ROBs and 25 Road under passes. 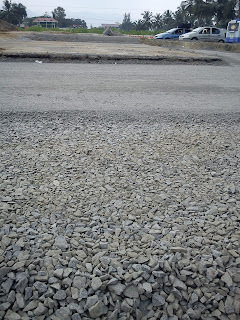 The road is constructed mainly of 6 layers namely Embankment, Sub-Grade, Granular Sub Base, Wet Mix Mecadam, Dense Bituminous Mecadam, Bituminous Concrere. Each layer has their properties. Based on the pavement design the thickness of each layer is being decided. If the thickness of embankment layer became more than 200mm it is constructed in separate layers of 200mm thickness for ease of compaction & consolidation. First the Survey is done to find out the OGL (Original Ground Level) or NGL (Natural Ground level). Then the testing is done on the soil present in that land. If it is having enough strength it can be used as embankment. Otherwise that soil is removed and replaced with new soil which is having the required strength. 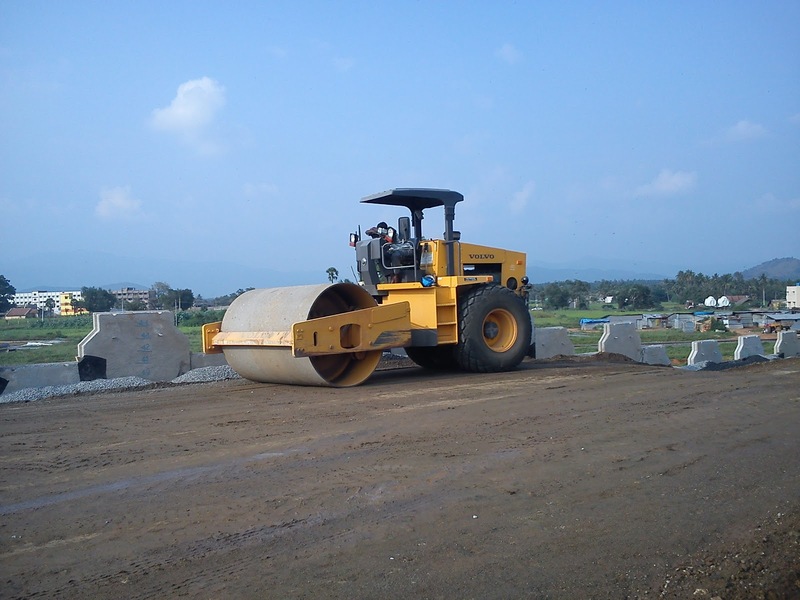 For compaction water is applied and compacted with road rollers (vibratory rollers). Sub grade consists of high strength soil. 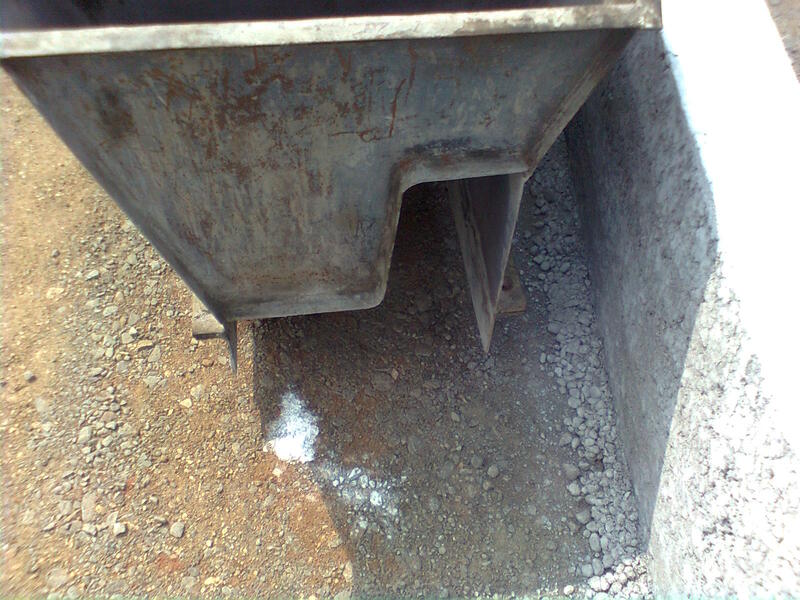 Granular sub base (GSB) consists of coarser aggregates of different sizes as specified. The main purpose of GSB is to drain off the water from the pavement layers above and reduce the pore pressure from below layers. So it keeps the above layers always dry. 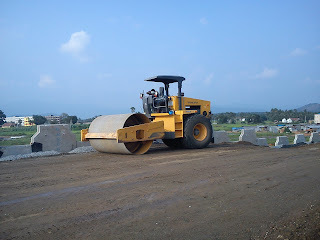 It is spreaded by paver/grader and compacted by Vibratory rollers. 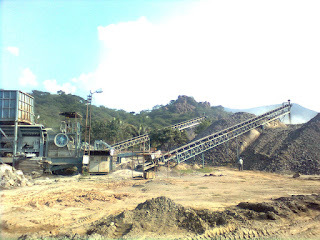 Wet Mix Mecadam (WMM) consists of aggregates of medium 7 finer aggregates, crusher dust and water. 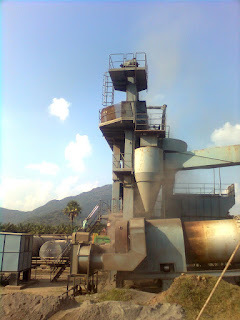 It is mixed in wet mix plant. Above WMM prime coat is applied to fill the voids present in that layer. After 24 hours the Tack coat is applied to create bond between bitumen and aggregate. Dense Bound Mecadam (DBM) consists of aggregates of different sizes and mixed with VG-30 grade bitumen. 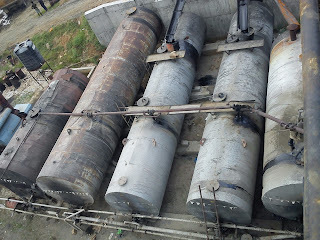 Bitumen Concrete (BC) consists of Aggregates and Crumb Rubber Modified Bitumen (CRMB) which is mixed in hot mix plant. In this laying process the new technology named Sensor paving is used and the equipment is known as Sensor paver finisher. In this along the direction of road to be laid a steel thread is tied at regular intervals by surveying. The sensor paver finisher having the mechanical hand which touches the rope during the movement of paver automatically adjusts the thickness of BC to be laid to avoid undulations and keep the finished surface to the required levels by taking the metal thread as reference. 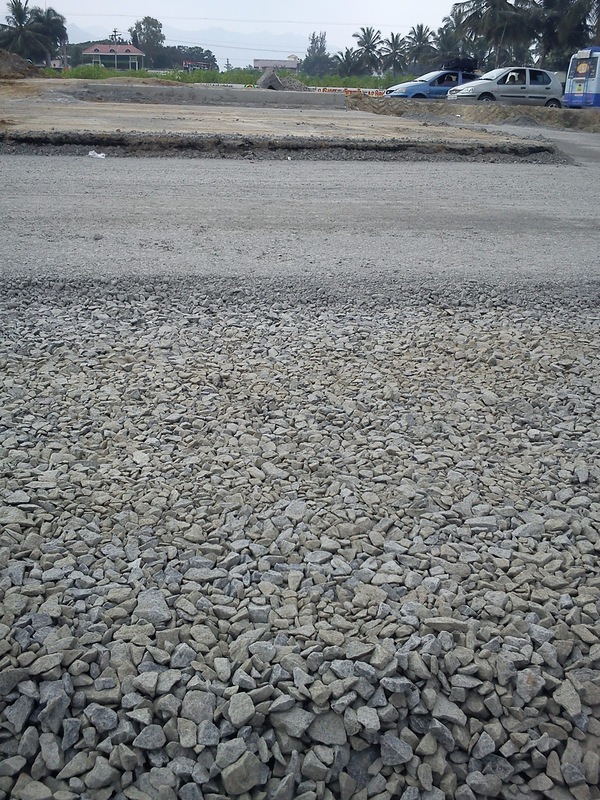 So that we can get the undulation free road surface. This paver also having screed of length 2.5mtr which is expandable up to 8.5metre and having the tamping and vibrating unit for better compaction. It is driven by the Diesel engines. The four lane is divided into two separate lanes for onward and reverse directions by the median of width 4.5m and the longitudinal toe drains are constructed all along the road. 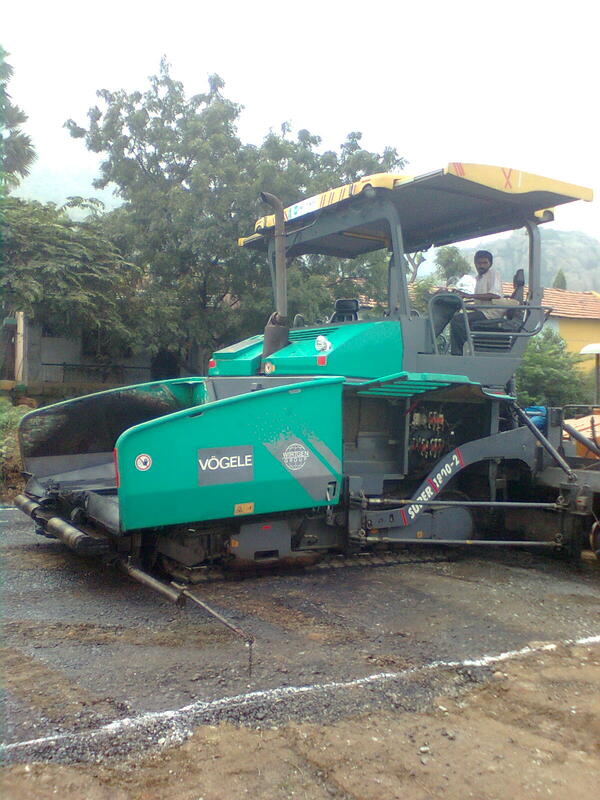 For the kerbs the automatic concrete paver is used. In this the tests for Soil, Aggregates, Cement, Concrete, Bitumen and Water are done. 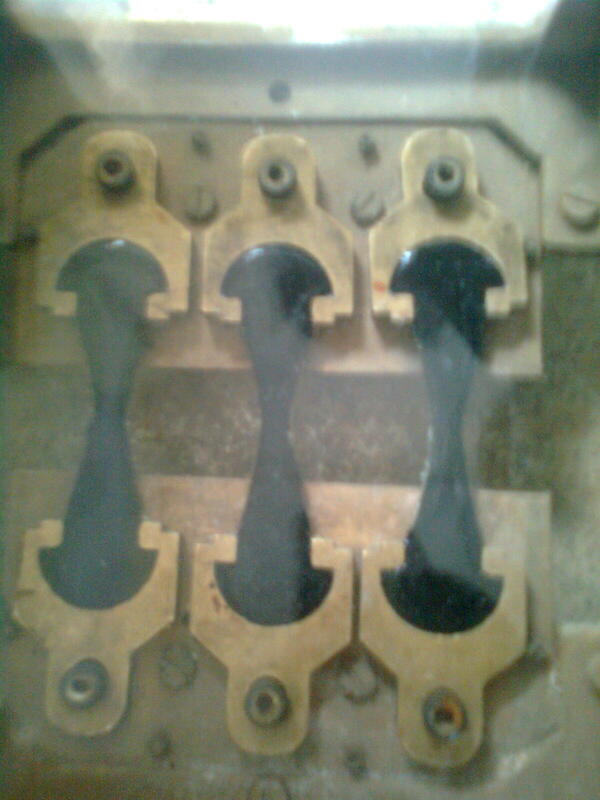 For these tests the samples are collected from field and also from the manufacturing units. The concrete batching plant mixes the cement, fine aggregate, coarse aggregate, water and admixture. In this FOSROC SP-430 Conplast ES2 admixture and Shaliplast SP-431 are used as admixture to maintain the workability of concrete. 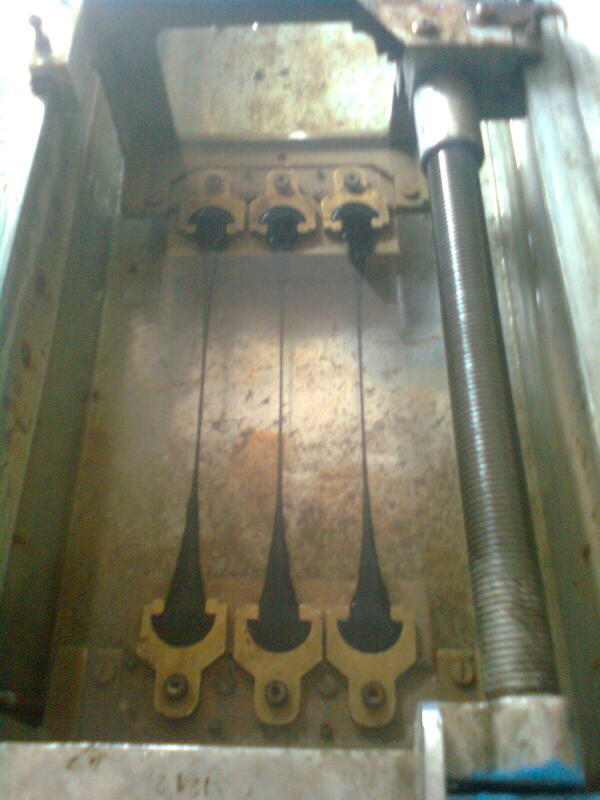 The output capacity of this plant is 15m3 per hour. The estimation of this plant is about Rs.50lakhs.From the batching plant it is transmitted to the site through transit mixer. 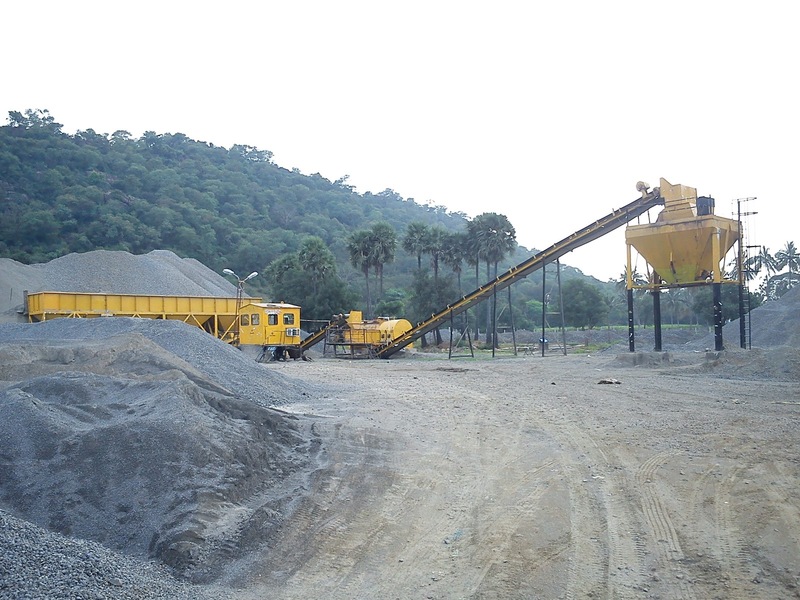 It mixes the aggregates, crusher dust and water and makes WMM. The hot mix plant mixes the CRMB bitumen and aggregates and places in the truck. Generally the laying temperature of the BC will be about 1200C. So the BC is prepared for about 1600C. 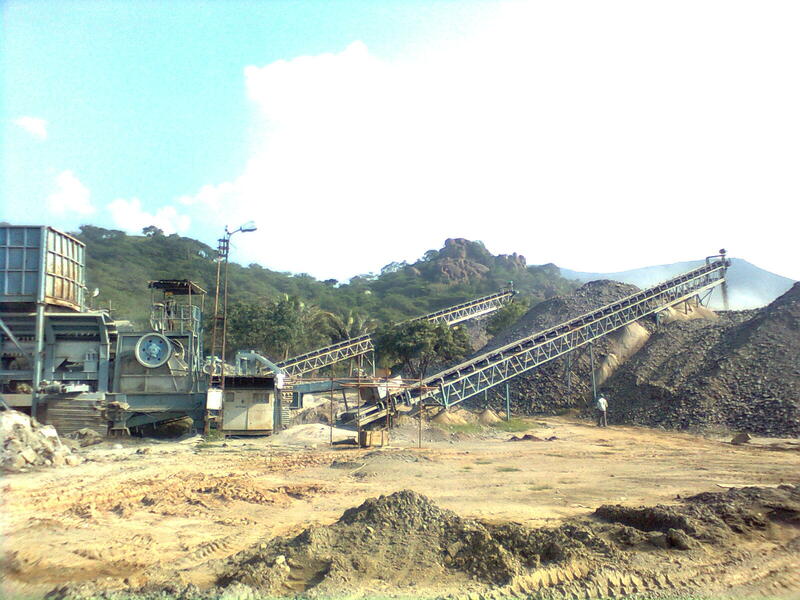 The capacity of this plant is 120ton/hour. 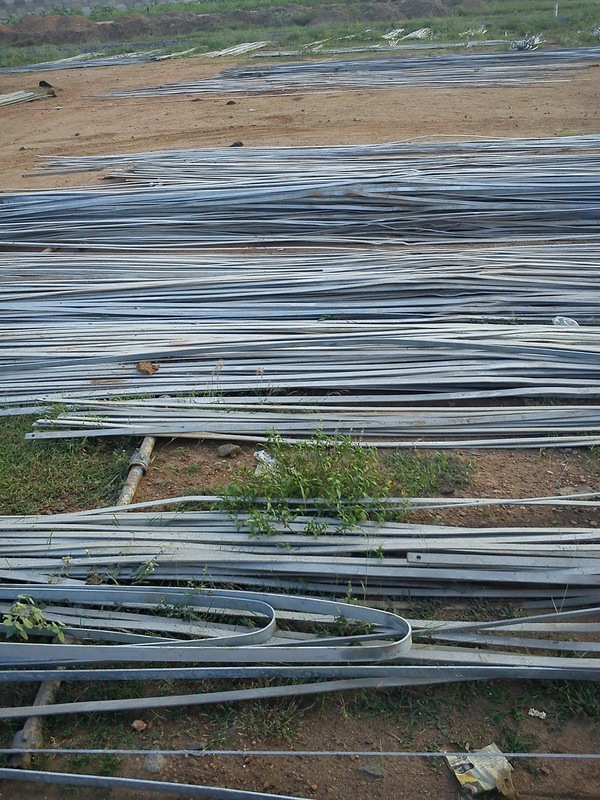 The plant costs about 1.25crores. 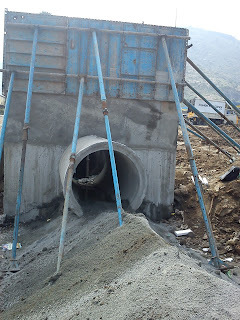 Culverts are structures used to drain out the water (continuation of canal) from one side to another side of the road. Two types of culverts are used in this project namely Box culvert and pipe culvert. 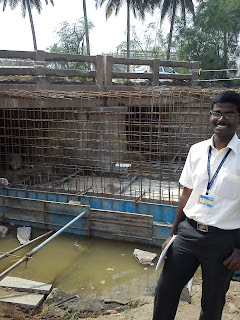 Wherever the link road crosses the main road, road under passes are built with raised embankments or RE (Reinforced Earthen) panel walls. Wherever the river crosses the road major bridges are built. 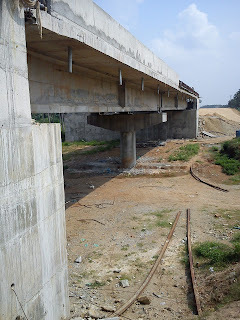 These are having the raised embankments at both sides and in centre it has PSC girder or RCC girder based on span. The weep holes all around the embankment drains the seepage/pore water entering into the embankment backfill soil. 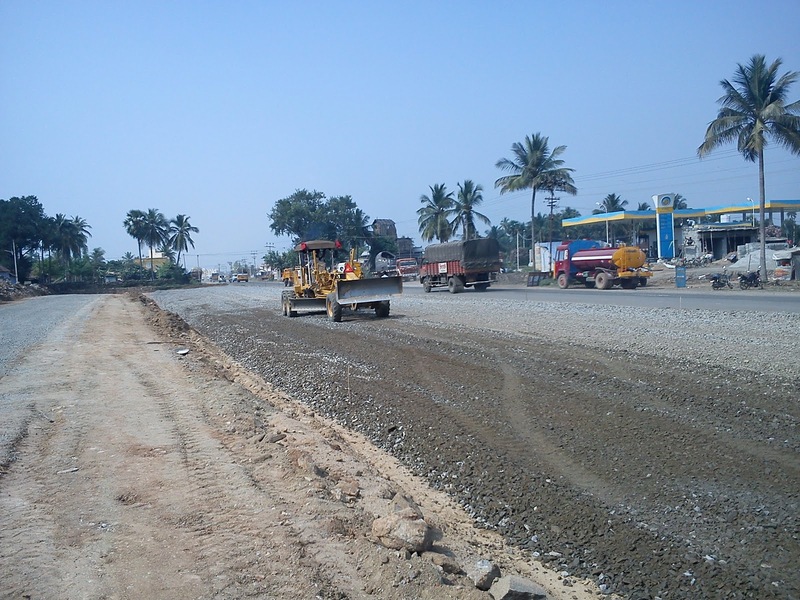 The embankment is built with the layers of soil compacted with vibratory rollers upto the specified compaction. For embankments of height more than 3m stone pitchings are used for the stability of slope and turfing for the lesser heights. 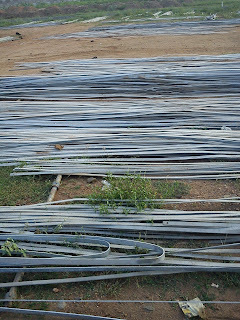 RE panel walls having the tendon bars coated with GI (to protect from corrosion) from one end of wall towards centerline for the stability of walls or Geo synthetics are used as reinforcement. Because of soil having enough bearing capacity Open foundation (Shallow foundation) is used in this project. 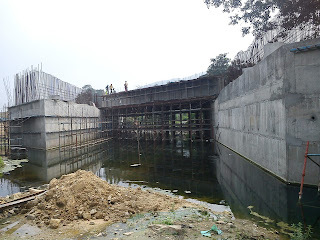 It is built as usual like ordinary concrete structure with formworks and concrete pouring. Pier and pier-cap are also made by the same method. Pot/PTFE bearings are used between pier-cap and girder to absorb vibration, allow moment and to transfer the load safely. To construct the cast-in-situ girder form works, scaffoldings and centering-shuttering works are needed. PSC girders are used wherever the span increases beyond 25m. Pre Stressed Concrete girders are made of Concrete with High tensile steel cables. 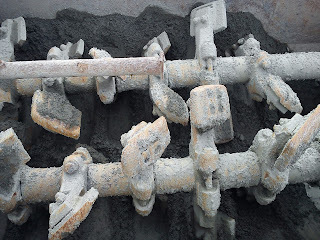 After concreting the stressing is done by hydraulic jacks. Then grouting is done to arrest the gap between the strands and sheeting. 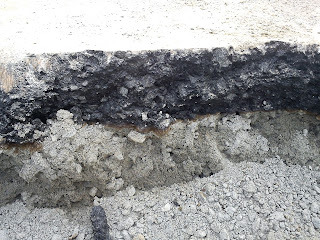 · 15mm thick mastic asphalt as base course for bearing the BC layer over deck slab. 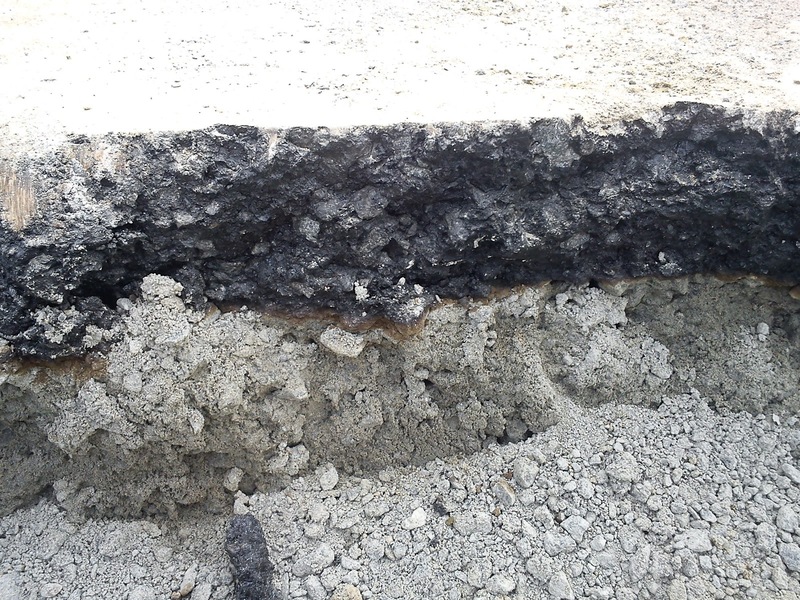 · 50mm thick bituminous concrete over mastic asphalt with proper slope to drain rain water. · Median is provided in to prevent the head to head collision between vehicles moving in opposite direction. 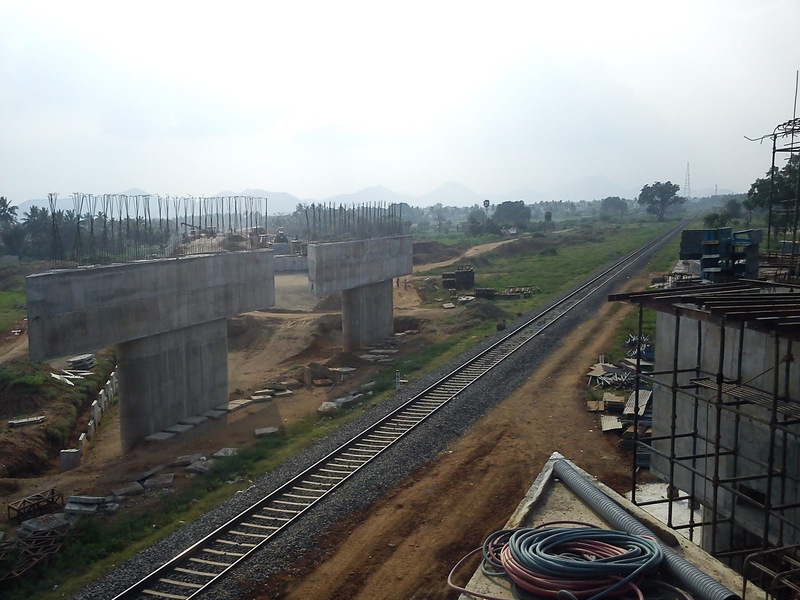 This project is having a positive grant element to cover the construction cost of the project by NHAI. The total project cost of this project is Rs.941crores with construction cost of Rs.1061crores of which Rs.366.05crores is provided as Grant by NHAI. The investment amount on the construction cost is recovered through the toll collection for the concession period of 25years which includes 36 months construction period. The Reliance Infrastructure is contributing minimum of 20% of construction cost and lending the remaining amount from Banks. Road projects definitely developes our country and we proud to be a part of our country’s growth. Today’s modern high speed roads needs undulation free smooth road suface. For that Sensor paving technology can give very better results. 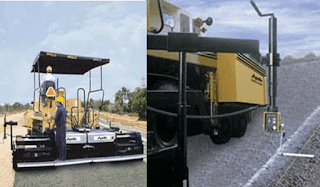 This technology needs advanced paver finisher with electronic sensing device. Electronic sensind device has two main parts. One to take a reference signal from the reference line and the second one to stimulate the movement, parallel to the reference line. For this purpose it is essential to pull a wire all along the length of the track to be laid. This wire is set at the exact level and curve, so that the electronic levelling instrument takes reference from this line. A mechanical arm, loosely touches the wire as the machine travels gives signals to the main electromagnetic hydraulic system. If the position of the screed with refernce to the reference line is correct, the machine maintains the same setting and keeps on laying the same thickness. The moment there is a variation of any kind i.e. dent or a bump on the road, the wheels of the machine sinksdown or rise up with respect of the reference line and then mechanical arm changes its position with respect to the reference line. 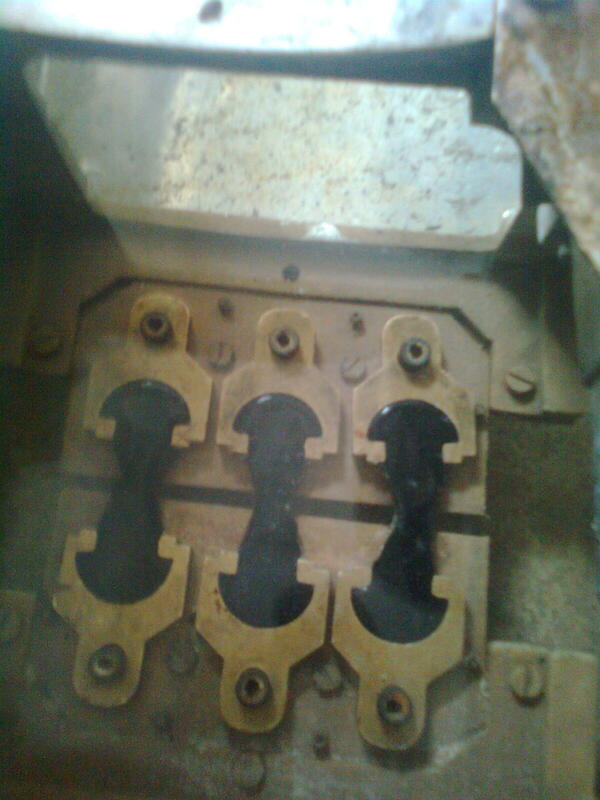 This sends an impulse to the main control unit which acuates the hydraulic cylinders on the auxilliay arms. 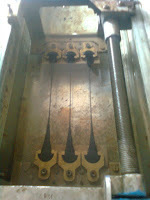 This corrects the screed suspension in such a way that the laid track maintains the same level difference all the time.